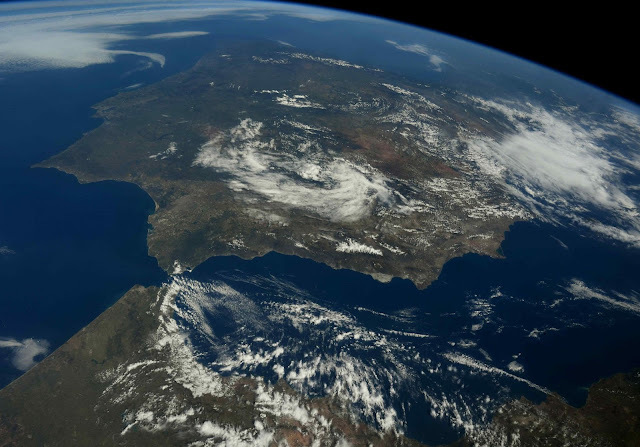 U.S. Astronaut Ricky Arnold: "The Strait of Gibraltar between Spain and Morocco. Hercules completed his 10th labor here. I’d prefer to sit in a café along the shore." The Strait of Gibraltar is a narrow strait that connects the Atlantic Ocean to the Mediterranean Sea and separates Gibraltar and Peninsular Spain in Europe from Morocco and Ceuta (Spain) in Africa. The name comes from the Rock of Gibraltar, which in turn originates from the Arabic Jebel Tariq (meaning "Tariq's mountain") named after Tariq ibn Ziyad. It is also known as the Straits of Gibraltar, the Gut of Gibraltar (although this is mostly archaic), STROG (Strait Of Gibraltar) in naval use, and in the ancient world as the "Pillars of Hercules" (Ancient Greek: αἱ Ἡράκλειοι στῆλαι).